Getting the first job is an experience which cannot be explained in terms of words. Its something which makes you feel as if you have got wings, you can fly as higher as you wish. I felt the same. I couldn’t sleep that night, read whatever I could find about life at Infosys Mysore campus. Finally the day came when I joined Infosys along with some of my friends and hundreds of others. We were allotted hostel rooms where we had to stay for the training duration. When we were taken to the hostel buildings, I got the chance to have a glance at the amazing campus which I dreamt for so many months. I was finally here, Infosys Mysore. I got room on the 5th floor. The room was awesome, one room per person with all the facilities like huge king size bed, big LCD TV with cable connection, study table, chair, bedside tables, bedside reading lamp, a sofa with table, table lamp, electric cattle, cup, spoon, big cupboard, electronic locker, laundry bag and a very nice attached bathroom with a life-size mirror. There was a large sliding window, with beautiful double curtains, in the room which gave a nice view of a small pond behind my hostel building. There were two families of different breeds of ducks which kept quacking and playing in the water. Sometimes in the morning I used to find the white mother duck shining in the morning sunlight, crossing the road followed by four small cute ducklings which used to walk in a perfect rhythm. I found a variety of beautiful birds playing around and amazingly they didn’t fear from human. They knew it’s a safe place for them. Infosys Mysore campus is made like a small city with greenery all around. Walking here in such a peaceful environment makes you feel so good that you forget everything else. Many times in the evening I used to walk around the campus enjoying the scenic beauty and the peaceful life. 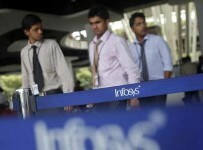 The first week was complete introduction to Infosys. We had a variety of sessions by all the departments of Infosys, even had a security demo for disaster management. It was all done in a big multiplex where they showcase movies on weekend. Most of the paper work was completed in the first week itself. Practically we had enough time to explore the campus in the evenings and we did it riding on the bicycles parked at various places in the campus. On the fourth day of our joining, we had a DJ night. We kept dancing until it was over. We all were highly motivated by now and slowly realizing the way of life we were going to spend for the rest of our lives. After the boring day-long sessions of first week, we were finally allotted classrooms and computers. All the friends were separated, and it was for the good reason. We were going to make a lot of new friends, but we didn’t realize that some of them will become friends for life. A great thing about Infosys training is that people come from all the possible places around the globe, not only from different states, but even from different countries. In our batch, we had great diversity. You can estimate it from this: I am from Uttar Pradesh. Around me used to sit people from Punjab, Orissa, Andhra Pradesh, Tamil Nadu, Karnataka, Delhi, Madhya Pradesh, Chattisgarh, Haryana, Kerala, Bihar and Jharkhand. I made friends from even West Bengal, Rajasthan, Goa and Maharashtra. This was possible only because of the huge diversity of people and surprisingly we all fitted together seamlessly. It was amazing experience and gave me friends which will stay close to my heart forever. Another good thing about Infosys training is that during training, we were considered strictly as students and had to study as if we were in a college. One of my friend rightly said that it should be considered as the ninth semester of B.Tech. But where on earth you get paid for studying? It happens in Infosys. We were getting paid for studying, for performing nicely. It was a win-win situation for us, going through a world class training experience and that too while getting paid.